"When did we permit the Jester to start doing impressions?" Here's a cartoon from the current issue of Private Eye which shows that they don't just use topical cartoons. More medieval humour, that's what we need. 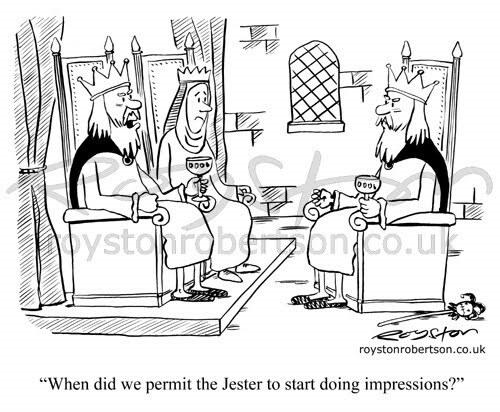 Exaggeration is the key to this joke, and I went to great trouble to make sure that the mimicking Jester is an exact copy of the King, right down to the throne and the way he's sitting. Excellent cartoon. At first glance (before reading your explanation) I'd wondered if you'd copied and flipped the king in Photoshop, so I'm well impressed! Hey, just because I said I went to great trouble it doesn't mean I didn't cheat! I often do my roughs in Photoshop, as it's easier to move elements around, then print them and put the printout on the lightbox for inking. I know this seems incredibly Luddite but I just prefer the brush pen line. So, I flipped the image in Photoshop, redrew the hands so the goblet is in the left hand and the right hand is clenched, then printed it. As the whole thing is re-inked the characters look very similar but not exactly the same. And looking at it now I realised I forgot to draw the base on the Jester's goblet! It's there, Royston - but it's behind the arm of his chair. Great cartoon! 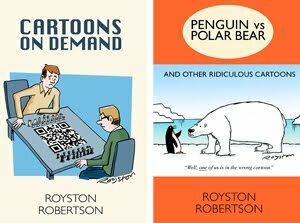 Nice one, Royston! I use photoshop LOTS for composition - saves pages and pages of thumbnail sketches, not that I'm neurotic about this sort of thing at all - but I think your cartoon really benefits from the proper redraw. What size do you do your originals? Cathy, I agree. Sometimes I've scanned what I *thought* was a finished drawing but have then altered elements so much in Photoshop that I have gone on to print it out and redraw it! It gives the drawing fluidity I think. I draw on A4 and usually fill most of the page. Yes, and you need to redraw because all the messing, enlarging and shrinking in potatoshop changes the line widths, so you need to redraw anyway. The potatoshopped ones are always a lot more adventurous than the the original ones!